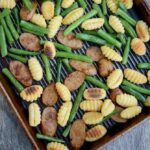 This Sheet Pan Gnocchi with Sausage and Green Beans recipe is a quick, healthy dinner the whole family will love. Ready in 20 minutes and easy to customize with your favorite veggies. 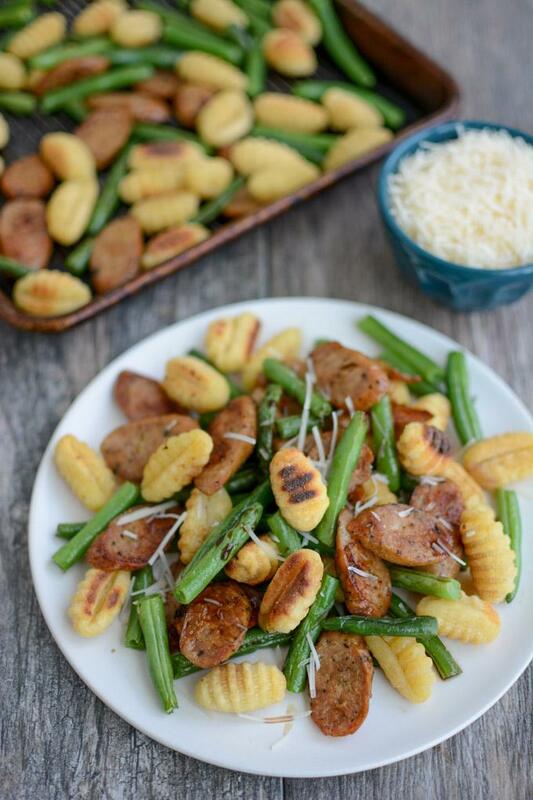 This Sheet Pan Gnocchi with Sausage and Green Beans just might become your new favorite dinner. I’ve made it 4 times in the past two weeks while testing it and it’s just so darn good. And so so easy. Literally, all you have to do is spend two minutes slicing up a few chicken sausages and green beans, throw it all on a pan and stick it in the oven. I chose to use green beans but you could easily sub broccoli or even add a few extra veggies. If you’re a tomato fan, I’d suggest tossing some cherry tomatoes on the sheet as well. They burst open and add some juiciness. I tested this with both shelf-stable and frozen gnocchi and both worked just fine. Be sure to add the green beans halfway through so they don’t get over-roasted and stay crisp-tender. I tried this recipe with a couple of sauces. My favorite was drizzling everything with balsamic vinegar after it was done and sprinkling with parmesan. You could also toss it in some marinara when it comes out of the oven, or serve marinara on the side for dipping. If you want to trend away from the Italian version, try using spicy chicken sausage and topped my bowl with some of my spicy green sauce. 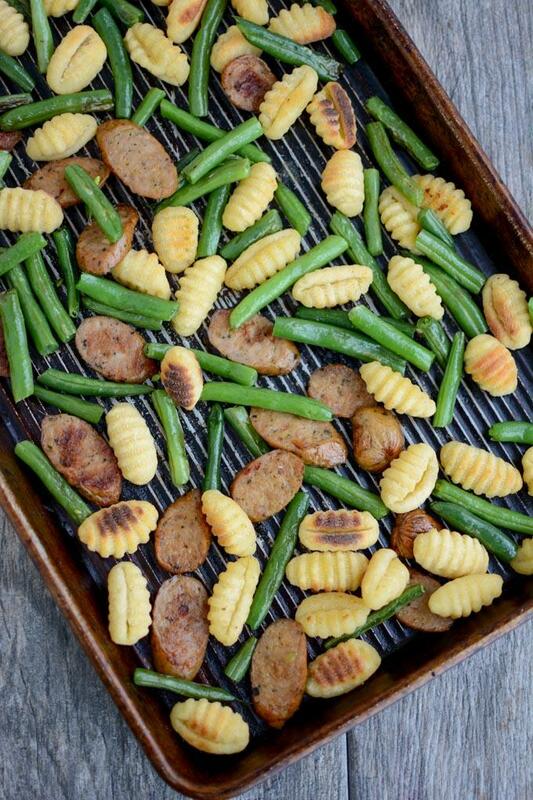 Put gnocchi and chicken sausage on a large sheet pan. Drizzle with oil and stir until well coated. Sprinke with seasonings. Remove sheet pan and add green beans to the pan. Stir everything and add a little extra oil if desired. Plate, drizzle with balsamic vinegar and top with parmesan (or desired sauce) and serve. You could sub broccoli for green beans or add cherry tomatoes. If using tomatoes, add them to the pan at the beginning. For additional sauce options, try tossing or dipping in marinara or going with a spicy sausage and adding a spicy green sauce before serving. See what I mean by easy?! 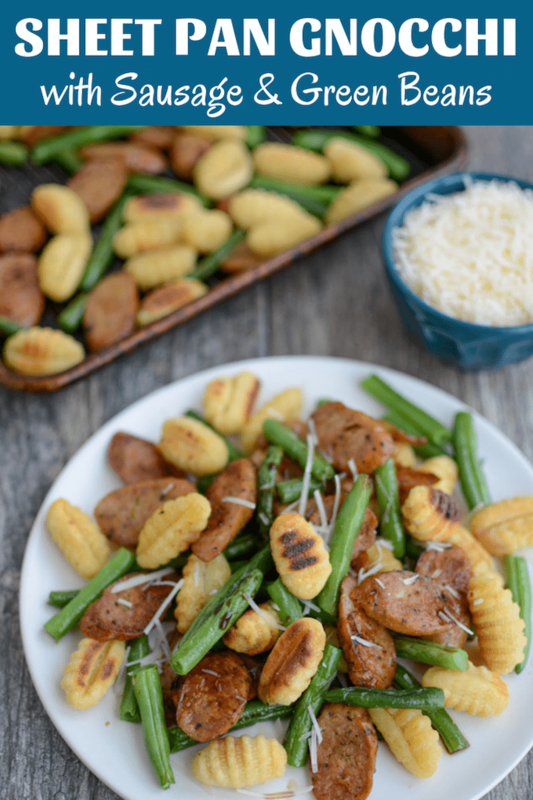 Let me know if you try this Sheet Pan Gnocchi with Sausage and Green Beans recipe! I made this for dinner tonight. It was delicious and an easy prep and cleanup. I used prepackaged green beans to save time and next time I will put them in at the very beginning. They were a little too crunchy for my taste with putting them in 1/2 way through. I did add cherry tomatoes at the 1/2 way point. I think adding them at the beginning they would have been too mushy. So tasty!! Everyone in my house loved this, including my 10 month old! Thank you for these quick and easy one sheet meals. If you do frozen gnocchi, would you modify the timing? nope! i did it for 18-20 min from frozen. Can Trader Joe’s cauliflower gnocchi be used instead of traditional gnocchi? i believe so…but i haven’t tried it myself!